Bringing together objects and pictures for all-inclusive view is always fun and can add a lot of reality and viewing comfort to the scene. Picture an interior designer showing separate pictures of hallway, staircases and dining area. Now think of a complete picture of the entire interiors of your dream house. The second choice of merging photographs certainly sounds better and would surely help you in making a quick decision. But it is practically impossible to capture 360 degree in a single frame; it is at this stage that individuals and professionals benefit from 360-degree panorama photo stitching services provided by expert image editing company. Image stitching is not an easy task as it requires a lot of experience and expertise in panoramic photography which is carried out by our image stitching experts having in-depth knowledge for using the best panorama software. We combine multiple images to capture the entire scene in a single 360-degree shot that enables visitors to visually explore the differentiating features of the property. We manually enhance the features of each picture and finally check the quality of the output to ensure that the photographs maintain their aesthetic appeal as well as satisfy the client requirements. We offer two popular types of image stitching techniques, i.e., the auto stitching and batch stitching methods. With our real estate photo editing services and 360-degree virtual tour, we can improve the overall look of the architectural properties by showcasing its interiors and exteriors in the best possible way to attract prospective buyers. With the help of quality image stitching, we combine a series of photographs by perfectly aligning and blending them to create exceptional panoramic images. This enables our clients to get a real-time experience of visiting the property without having the need to go to the actual location. We provide our services for various residential and commercial properties such as houses, schools, hotels, hospitals, etc. Read this case study and know how a real estate company benefited through our Panorama photo stitching. 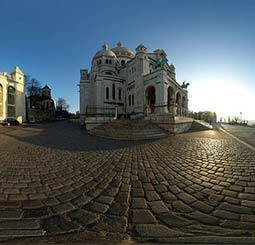 We provide best 360-degree panorama image stitching and virtual tour solutions for industries like real estate, advertising, media, architecture etc across various countries including UK, USA, Canada, Philippines, Sweden, Norway, Italy, Germany, Poland, Egypt, Switzerland, New Zealand etc. Hire our professional and efficient Photoshop panorama stitching services and get your images enhanced and merged for a complete viewing pleasure.